Emperor Antoku (安徳天皇 Antoku-tennō) (December 22, 1178 – April 25, 1185) was the 81st emperor of Japan, according to the traditional order of succession. His reign spanned the years from 1180 through 1185. 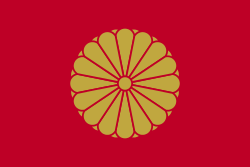 During this time, the imperial family was involved in a bitter struggle between warring clans. Yoritomo, with his cousin Yoshinaka, led a force from the Minamoto clan against the Taira, who controlled the emperor. During the sea battle of Dan-no-ura in April 1185, a member of the royal household took Antoku and plunged with him into the water in the Shimonoseki Straits, drowning the child emperor rather than allowing him to be captured by the opposing forces. The conflict between the clans led to numerous legends and tales. Antoku's tomb is said to be located in a number of places around western Japan, including the island of Iwo Jima, a result of the spreading of legends about the emperor and the battle. Before his ascension to the Chrysanthemum Throne, his personal name (his imina) was Tokohito-shinnō (言仁親王). He was also known as Kotohito-shinnō. His father was Emperor Takakura. His mother, Taira no Tokuko (平徳子), second daughter of Taira no Kiyomori (平清盛), was later referred to as Empress Dowager Kenrei (建礼門院, Kenrei-mon In). Antoku was named crown prince at around one month of age. He ascended the throne at the age of two. Naturally, he held no actual power, but rather his grandfather Taira no Kiyomori ruled in his name, though not officially, as sesshō (regent). 1180 (Jishō 4, 21st day of the 4th month): In the 12th year of Takakura-tennō 's reign (高倉天皇十二年), the emperor was forced to abdicate; and the succession (‘‘senso’’) was received by his infant son, the grandson of Taira Kiyomori. Shortly thereafter, Emperor Antoku is said to have acceded to the throne (‘‘sokui’’). In the year of his enthronement, the capital was moved to modern-day Kōbe, Hyōgo, but it was soon moved back to Heian-kyō. 1183 (Juei 2, 20th day of the 8th month): Go-Toba is proclaimed emperor by the Minamoto; and consequently, there were two proclaimed emperors, one living in Heian-kyō and another in flight towards the south. In 1183, when Minamoto no Yoshinaka entered the capital, the Taira clan fled with the young emperor and the sacred treasures to Yashima (the name of a place inside modern-day Takamatsu, Kagawa). Being defeated in ensuing battle, they fled westward. 1185 (Genryaku 2, 24th day of the 3rd month): The Taira and the Minamoto clashed in the Battle of Dan-no-ura. The Taira were defeated. 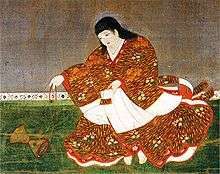 Antoku's grandmother, Taira no Tokiko, Kiyomori's widow, drowned herself along with the young emperor. His mother also drowned herself, but apparently, according to The Tale of the Heike (Heike Monogatari), she was pulled out with a rake by her long hair. According to Yoshitsune's dispatch, the sacred seal was found, but the sacred sword was lost. The sword was one of the three sacred treasures. The story of Emperor Antoku and his mother's family became the subject of the Kamakura period epic poem The Tale of the Heike (Heike is an alternate reading of the Japanese characters for "House of the Taira"). After his drowning, in order to mourn the body and placate any restless spirits, the Amidaji Goeidō was built. Later, Antoku was enshrined at the Kurume-Suitengū in Kurume, Fukuoka, and he came to be worshipped as Mizu-no-kami (水の神, lit. "water-god" or "god of water"), the god of easy delivery at Suitengū (水天宮, lit. "water-heaven/emperor-shrine") everywhere. With the establishment of Shintō as the state religion of Japan, the Amidaji Temple was abandoned and the Akama Shrine was established in Shimonoseki in Yamaguchi prefecture to celebrate Antoku. The Imperial Household Agency designates Amida-ji no misasagi (阿彌陀寺陵) near Akama Shrine in Shimonoseki as Antoku's tomb. The years of Antoku's reign are more specifically identified by more than one era name or nengō. ↑ Titsingh, Isaac. (1834). Annales des empereurs du Japon, pp. 200–207; Brown, Delmer et al. (1979). Gukanshō, pp. 333–334; Varley, H. Paul. (1980). Jinnō Shōtōki. pp. 214–215. ↑ Jeremy Roberts: Japanese Mythology A to Z, 2nd edition, 2010. ISBN 978-1-60413-435-3. ↑ Titsingh, p. 200; Brown, p. 333; Varley, p. 44; n.b., a distinct act of senso is unrecognized prior to Emperor Tenji; and all sovereigns except Jitō, Yōzei, Go-Toba, and Fushimi have senso and sokui in the same year until the reign of Emperor Go-Murakami. ↑ Kitagawa, Hiroshi et al. (1975). The Tale of the Heike, p. 787; Titsingh, pp. 211–212. ↑ Sansom, George (1958). A History of Japan to 1334. Stanford University Press. pp. 303–305. ISBN 0804705232. 1 2 Brown, p. 333. ↑ Ponsonby-Fane, Richard. (1959). The Imperial House of Japan, p. 422; n.b., although Ponsonby-Fane indicates that the official shrine was in Kyoto in the 1930s, the credible, but unsourced text at the bottom of this article explains that the current location of the shrine is in Shimonoseki. ↑ Titsingh, pp. 200–207; Brown, pp. 333–334. According to Shimonoseki City Information: "In the Middle Age, the last battle between the Genji clan and the Heike clan broke out in Dannoura on 24 March 1185 and Yoshitsune won the battle by using the tides."